When Guru Nanak was about four or five years old he would wander outside his house for short walks. When men or women spoke to him, they would be astonished to listen to his replies. Guru Nanak would talk like a wise man. People would comment that he spoke so intelligently for one so young. Guru Nanak would often speak of God, he would say 'He is there and there' (meaning God is all around). Guru Nanak would often give household items to those in need. He would give bread and butter to visiting friends and let them have the toys that his family had given him. Guru Nanak was not attached to everyday items, he loved sharing. He did not care for possessions as others did. Once a Sadhu required a jug to drink from, Guru Nanak gave him one from his mother's kitchen. Guru Nanak came from a kind and loving family, he was always extremely happy. Mehta Kalu, Guru Nanak's father, decided that Guru Nanak should start to learn from a proper teacher. He sent Guru Nanak to Pandit Gopal, the village teacher, to learn to read, write and do sums. 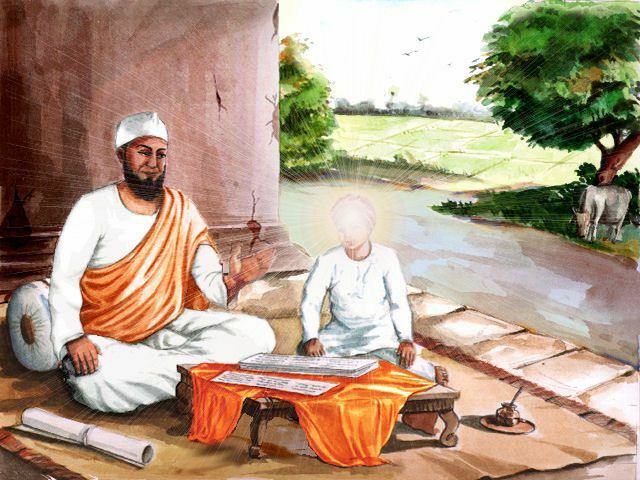 When Guru Nanak was about five years old, Mehta Kalu asked Gopal to teach Guru Nanak to read, write, learn arithmetic, learn accounts and whatever other knowledge he had. A Sunday was selected as the most auspicious day for Nanak to begin his school education. Mehta Kalu offered five rupees to Gopal, as a mark of respect and distributed sweets to all the school children. In India wooden tablets in black were used to teach children the letters of their language. The tutor would write the letters of the alphabet with a chalk on the tablet; and the children repeat aloud with much noise and energy. The tutor wrote the alphabet for Nanak, however much to his surprise Guru Nanak read the alphabet as if he knew it already. Then the tutor wrote numerals, one to ten. Guru Nanak quickly repeated them. The tutor was amazed. In deep thought he went and sat on his carpet. 'So, the boys are right,' said he, 'when they say that you keep on humming and composing poems. You really are a Shair (poet)'. He found on the slate an acrostic, written in couplets of extremely simple Panjabi language. What surprised him was the profound thoughts of the poems. Guru Nanak kept his writing board in front of him and sat down with eyes closed and quiet. Guru Nanak continued learning for some more days. One day, the tutor called him and asked, 'I have taught you to write sentences. Have you written any?'. Guru Nanak brought his writing board and showed it to the tutor. On the writing board was written, 'It is He, who is the creator, one Lord of all. Those who remember God from their heart, are serving God. Their life has become fruitful. When the tutor read all that he had written, he looked at the child's face and at his feet. The tutor's head bowed down in respect and he thought, this young child knows so much about God. Even the pandits don't know as much. Maybe he has come as a prophet from God. Taynka: Why do you practice hypocrisy, O mortal? In a moment, in an instant, you shall have to get up and depart. Taynka: The terrible world-ocean is so very deep; its limits cannot be found.